With great excitement (and a little relief!) and with deep gratitude to one of our pre-seminary students – Doner Bartolon – we can announce officially that the new PRC Seminary website is launched and live! In reality, we did so a few days ago already, but had some more content to add/fix and some tweaks to make. And there is more to come, but we felt confident that the site was good to go now and that it was worthy to make public. The design is simple yet professional, and the site easy to navigate. You will see that the homepage gives you a basic slide show and then introductory content on the seminary, including the latest events and blog post (Yes, the new site has its own blog!). Yes, Doner, of Mexican descent, had to be sure to add the Spanish page, which is good and we hope useful to those Spanish-speaking men interested in our theological teaching and ministerial training. The “About Us” tab features three sections – the faculty, the facilities and our staff. Under “Resources” you will find the online library catalog, our PR Theological Journal (with the brand new issue – Fall 2018 – featured! [as well as all 102 past issues with an Index]), our bookstore, online classes available, and the writings and speeches given by our professors. This will also be an ever-growing collection of items. “Admissions” focuses on the requirements for applying for and entering our seminary, and includes our newly revised catalog (Fall 2018). The next tab, “Seminary Activities,” includes a “News” section and an “Events” section. You will want to visit those often – and, in fact, at the bottom of any page on the website you will find a signup box to receive updates to the site. Be sure to add your email address to the already growing list! On this page you will also find our seminary calendar, where both the daily activities as well as the special activities of the seminary are noted. Next are the “Contact” and “Blog” tabs, where you will find contact information (seminary phone numbers and info@prcts.org) and our new blog feature. A few posts have been made, but here too, look for more to come – from our faculty and registrar, as well as from our secretary and students. I wish to call special attention to the upcoming Interim course, scheduled from Jan.4 – Jan.15. Prof. B. Gritters, by rotation, will be teaching his special course on “Heidelberg Catechism Preaching.” In addition to an open invitation to those in the area to attend, especially our ministers, we will be live-streaming the course through our YouTube channel. The other event to pay attention to is our 2019 Dordt400 Conference, set for April 25-27 at Trinity PRC in Hudsonville, MI. You will know by now, we trust, that there is a special website devoted to this, and we hope that you are making plans to attend all or most of this significant event. Thanks for your attention – now go check out the website! On our history/archive day we will broaden our scope a bit and mention this news that came from the Michigan Archival Association this week. On January 31st, DPLA (Digital Public Library of America) announced that collections from the Michigan Service Hub are now live and ready to view! Quoting from the announcement, “As of this week, the Michigan Hub partners have made 42,000 new items discoverable in DPLA and plan to add more in the future. Follow the link below to the full official DPLA announcement and then on to the Michigan collections! We are pleased to announce that the collections of the Michigan Service Hub are officially ‘live’ in DPLA and ready to explore! Accepted to the DPLA network in 2015, the Michigan Service Hub represents a collaborative effort between the Library of Michigan, University of Michigan, Wayne State University, Michigan State University, Western Michigan University and the Midwest Collaborative for Library Services. As of this week, the Michigan Hub partners have made 42,000 new items discoverable in DPLA and plan to add more in the future. Michigan’s contributions to DPLA are rich in the state’s local history and culture including the auto industries of the Motor City, but that’s not all – look for collections and items representing such diverse topics as Civil War soldiers’ experiences, cookbooks, botany, and social protest posters. Take a peek below at some of the newly-added materials from the Michigan Service Hub and start exploring today! Yet another article on the ebook vs. the physical book debate? Yes, but this one is more than that too. This article from the past week (posted August 24, 2016) calls for ebooks and modern technology to master its form so as to encourage more reading in a variety of ways, even as we recognize now that the physical book is here to stay. The author has some points worth considering, even as I continue to embrace both forms of reading (But you should know my personal preference by now). Case in point: on this rainy Saturday in West Michigan I did some Kindle reading this morning, and then headed out to a local Christian thrift store to browse the books. I walked away with a bag of paperback and hardcover treasures (75% for the Seminary library, it turns out!). It has been a good day for books and reading. I trust for you too. …The common refrain for lovers of the printed word, is that the feel, the heft of a book is what draws their delight. How else to describe the difference between your Nook copy of Infinite Jest and the paperback edition, scuffed and shredded to death from countless bus rides, clipped together and written over throughout, a Field Notes notebook taped to back cover to keep up with characters—speaking from personal experience, there’s hardly a better way to read such a tome. Last week (June 8, 2016) pastor/author Tim Challies posted this interesting “what if” matter on his blog. In it he suggests that we would look at the ebook vs. standard print book debate quite differently if we reversed history. And I must admit, reading his article did make me appreciate the advances that have come with the Kindle and other ebooks. And I do use both – but in spite of the conveniences of the ebook, I still prefer the traditional book. Both forms are here to stay, at least in my home. Here is a portion of what Challies posted; find the rest at the link below. Imagine if ebooks came first. Imagine if Gutenberg had not created the printing press but the Kindle. Now, hundreds of years later, we are beginning to experiment with this new medium of paper and beginning to acclimate ourselves to printed books. Though on one level this little scenario is absurd, it can also be an interesting thought experiment. Stick with me for just a few moments and I’ll show you. To understand some of the fear and criticism directed toward digital reading, we need to first understand the way we tend to relate to new technologies. We do not take any new technology on its own terms, but always in comparison—in comparison to what was dominant before it. In this way the old technology always has the upper hand and we consider it superior until the contender proves itself. You and I were born into a world dominated and shaped by the printed book. For this reason we are naturally inclined to consider it superior to all that has come before and all that will come after. We are disinclined to see the strengths of any new and competing medium, for to do that we must first admit the weaknesses of the old. This is especially difficult for a medium as important and well-loved as the book. Last week we did a post on the books that have impacted J.I. Packer in his life and work. For those interested in the Puritan part of his personal library – and reading it online! – check out this wonderful news release (see link below). I was not aware of this digital library before, but I plan to save the link to it now! Maybe you wish to as well. To access the library, visit the link provided above or below. Here’s an interesting history/archive news item for you. We have noted before this digitalization project by the British Museum, but now they are about to digitize the second largest map in the world – from the collection of King George III! Here’s a part of that story as taken from the source below. Visit the link to read more and visit the British Museum link to view the maps already available online. The British Library in London is a quarter of the way through a major project to re-catalogue, digitise and conserve a 50,000-strong map collection assembled by Britain’s famous collector-king, George III (1738-1820). Among the objects to be digitally photographed is the world’s second largest atlas, which measures a huge 1.8m by 2.3m. The Klencke Atlas, named after the Dutch sugar merchant Johannes Klencke, who presented it to Charles II in 1660, contains 41 large-scale maps made in the 1620s and 1630s, a period known as the Golden Age of Dutch cartography. The maps were intended to hang on the wall, but were bound into one giant book. Monergism.com, the beneficial website promoting articles and books of Reformed/Calvinistic persuasion, published this reading guide today and I think it is worth posting here, for the reasons they give (Christmas gift-giving) as well as for building your own personal library or church library. Check out the site at the link below. And if you have never visited Monergism before, be sure to poke around a while – including in their free ebook section. The latest free offering? J.Calvin’s On the Christian Life in multiple formats – otherwise known as the Golden Booklet of the True Christian Life (Baker, 1952). If you are giving books as a gift to your friends and family this year, we have compiled a list of some of the best classic and contemporary books for beginner, intermediate and advanced readers. If you work through the books on this list you will be devotionally enriched and will be giving yourself a solid theological education that you would not get at the vast majority of seminaries. This is certainly not an exhaustive list but a good foundation. This Bible app report has become an annual event now too, and it is always interesting as well as informative. What Bible apps and digital access to the Scriptures have done is amazing! Are you a regular user of this wonderful technology? Here is the report as provided by Christianity Today’s Sarah E. Zylstra. For the full story, visit the link provided below. 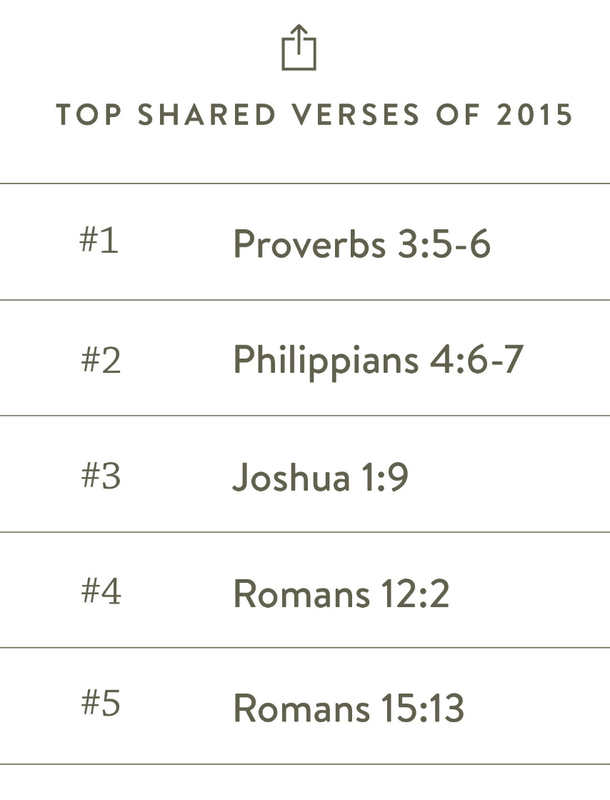 What was the most popular verse in your country, including the U.S.? Read on to find out – it may surprise you. Every second, the world conducts more than 40,000 Google searches, creates 5 new Facebook profiles, and opens YouVersion’s Bible App 112 times. In the app, three bookmarks are created, four verses are shared, and 18 verses are highlighted. More than 50 Bible chapters are listened to, and 342 chapters are read. YouVersion, launched by Life.Church in 2008, announced today that the Bible app has topped 200 million installs. The app now offers the Bible in more than 1,200 versions and 900 languages. I am always a bit sheepish about promoting Black Friday deals – and I might add, especially this year! I despise the commercialization of not only Christmas but also Thanksgiving. And with the glut of “pre-Black Friday” promotions this year, I am already burned out on “specials”. BUT, when it comes to promoting good books and good book deals, I am not only not sheepish, I have no shame. From that point of view, and because I also do not like the name “Black Friday”, we are going to call this our “Bright Friday Book Deals” post. In the meantime (and at the time of this posting Friday morning Challies has not yet updated his site), I can point you to a few good places to look. I am also going to add a few that he does not. Ligonier Ministries is having a terrific Friday sale today. And Reformation Heritage Books is also running a great Thanksgiving sale that runs through Dec.7. That includes this terrific deal – the ebook version of the four-volume set of Reformed Confessions of the 16th and 17th Centuries for $9.99 (retail is $89.99)! Grace & Truth Books – Great site for family and children’s books. Some children’s sets are 50% off this weekend. You will find something of interest to you there, no matter what your interests are, so check it out today if you haven’t for a while. And, of course, bookmark it so that it is a resource you use again and again. And don’t forget the bookshelf portion of the site, where you will find nearly 2.5 million books and periodicals in digital storage. Here’s a video that introduces you to the “wealth of knowledge” contained in this online library.